Charting the course of a 2015-16 student protest movement at the University of Cape Town in South Africa, The Fall, which won two major awards at last year’s Edinburgh Fringe Festival, delves into the roots and the demands of a political uprising that most Americans have probably never heard of–but that seems to resonate with the current state of the union. The details are extremely specific to the South African context, but the larger issues are familiar to all of us, and the piece hopes to inspire as well as to recognize the costs of activism. Debates about racial inequality, white supremacy, student debt, gender identity, self-determination and recognition, the rights of immigrants–all play a part in The Fall, as a core group of student leaders sees their movement burgeon from a single issue to a passionate cry for decolonization of both their university campus and their national psyche. Beginning with the slogan/hashtag #RhodesMustFall–an ultimately successful call to take down a statue of arch-colonialist Cecil Rhodes that stood on campus–and an occupation of the university’s main administration building, the movement grew and broadened, ultimately transforming into the ongoing #FeesMustFall campaign for free, decolonized education in South Africa and across the African continent, and then into #AfrophobiaMustFall (protesting the deaths of African nationals in South Africa) and #PatriarchyMustFall. It’s difficult, of course, to successfully capture the scope of a mass movement in a small theater, and in trying to create some representative students to dramatize the issues of the movement, the creators of The Fall (the cast plus writers Thando Mangcu and Kgomotso Khunoane) have aimed for archetype and only occasionally backslid into stereotype. (In the script, each character is identified with both a name and a functional role: “The One Who Discovers” or “The One Who Perseveres.”) One of the show’s strengths is its insight into group dynamics, the way people who don’t necessarily know each other (some of these students have been in classrooms together but none of them seem to be close before the protests) can quickly coalesce, and just as quickly fracture. Here, we see seven students, mostly students from poor backgrounds and township upbringings, but also one wealthier girl, Chwaita (Zandile Madliwa, who gives Chwaita a naive self-righteousness that is both endearing and annoying). Zukile-Libalele (Sihle Mnqwazana, who brings a barely concealed desperation that always threatens to shade into rage) is a medical student who’s at risk of being expelled; Camilla (Ameera Conrad, fiery and devastatingly precise in her analyses) is a Muslim queer woman who’s also “colored”–mixed-race–rather than black. Cahya (Cleo Raatus, who mixes resilience and vulnerability) is both a high-achiever (member of the student government before the movement, leader in other student organizations) and constantly feeling excluded by existing structures not just on racial grounds but because they are transgender. The first section of the show, depicting how the group comes together, introducing them and filling in their backgrounds, and setting up their first cause of action with the Rhodes statue, is effective but familiar. We may not have seen these details before, but we’ve seen this process, this dynamic: the tension between talk and action, the squabbles over the best strategy to achieve group goals, the uncertainty of whether the potential rewards are worth the risks. Director Clare Stopford keeps this moving briskly without ever rushing through key information, and underscores much of the early expositional scenes with beautifully sung a cappella music. But it’s when the students start to settle into their roles in the group and their commitment to the cause that the piece starts to dig deeper. These aren’t people who necessarily like one another very much, and some of them don’t even start out as particularly committed to the cause: Chwaita at first doesn’t “want to get arrested alongside people who wanted to perpetuate the stereotype of the angry black,” and Kgotatso (Oarabile Ditsele), an athlete who’s cut from the cricket team for not “gelling” with the white players who grew up together, hangs back and only enters the occupation when he feels fairly certain they won’t all be arrested immediately. As the movement starts to progress, the students start to relax into the community they’ve created–a black community, a community where for the first time in most of their lives, they are the most important people present, where their voices are listened to, they get to share their stories. They have a moment of triumph when the Rhodes statue comes down…and then they fragment. The fragmentation is where the piece shows a bracing honesty that sets it apart. Resisting the impulse simply to valorize their triumphs, the creators show, down to the smallest issue, where the students began to turn on one another; they’re particularly incisive on how gender dynamics play into these fractures, and the way the gendered dynamics of the Western/Eurocentric world intersect with those of the students’ native African cultures. In the end, though, the urgency of the cause, as it continues to evolve, proves magnetic enough to bring the leaders back together for a march on parliament. The end feels a little rushed and frantic, especially as they start to bring in real footage from the march. 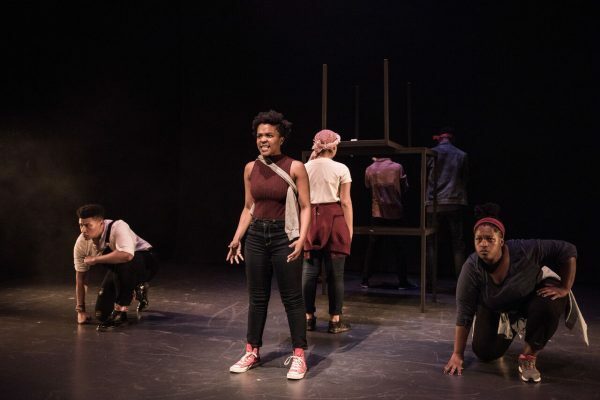 Still, the piece effectively displays the students’ passion and commitment, their very real personal struggles with white supremacy, and their simultaneous need to keep fighting and to be able to stop, are moving and powerful. The Fall runs to March 17, 2018. More production info can be found here.